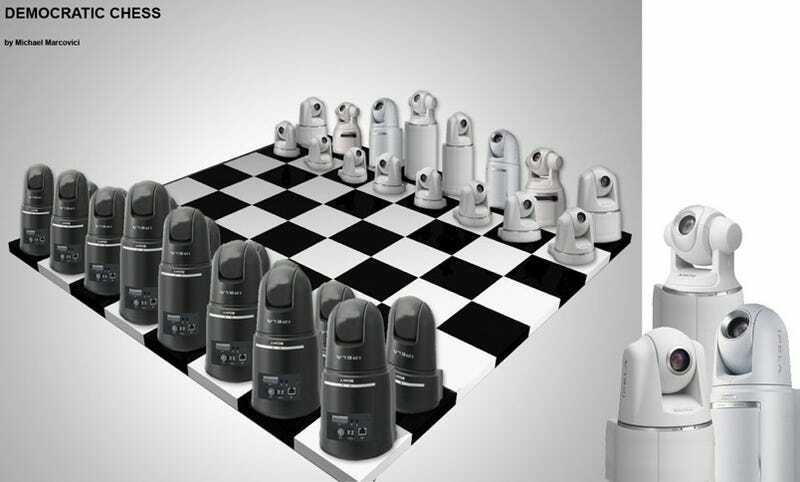 Designer Michael Marcovici is currently developing a working version of what he calls the "Democratic Chess Set" A IP-WLAN network camera built-in to each piece facilitates interaction between each other and a human player. The pieces would be capable of "listening and talking" to one another in an effort to decide the best possible move. The human player would also be part of this discussion and would be responsible for the final decision. So, it would seem that one of two outcomes is possible: it could result in a lot of bickering among pieces and players until the whole system grinds to a halt or the decision will effectively be made for the human player, making the game a pointless endeavor.